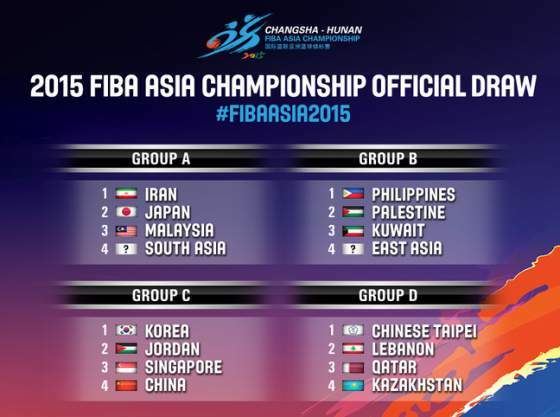 FIBA Asia Championship 2015 draw results: Philippines in Group B - Balita Boss! The Philippines joined Palestine, Kuwait and one East Asia Qualifier in Group B after a draw was held Saturday, June 27 for the 2015 FIBA Asia Championship at the Changsha in Hunan, China. This year's FIBA Asia Championship will take place from September 23 to October 3. The winner of the tournament qualifies for the Basketball tournament on the 2016 Summer Olympics, while the Silver and Bronze medalists will go under the FIBA World Olympic Qualifying Tournament. Reigning champion Iran is in Group A along with Japan, Malaysia and one South Asia Qualifier. Group C is composed of host country China, Korea, Jordan and Singapore while Group D has Chinese Taipei, Lebanon, Qatar and Kazakhstan. Each team will play all of the teams from its group once. The top three teams with the best record advance to the second round. The qualifying teams from groups A and B shall form Group E, while those from Groups C and D shall form Group F. The results against the teams that had also qualified would carry over. The top four teams from each group would proceed to the Quarter-Finals. The remaining teams will be played in a knockout format. Winning teams in the Quarter-finals will advance to the Semi-finals. Winning teams in the Semi-finals will advance to the Finals of FIBA Asia Championship 2015.